40 HANDS in forty days is a local fundraising and awareness campaign. The 40 HANDS staff have invited 40 nonprofits in the Denver area to come together for this 40 day campaign. Severe Weather Shelter Network is one of the 40! Each of us have shared our vision and mission through an organization profile page to help visitors learn more about how we are engaging our community in positive and life changing ways. Severe Weather Shelter Network is thrilled to share and invite the broader community to engage with the work we are doing in our communities! Did you know that Severe Weather Shelter Network is currently the only shelter in Jefferson County and the west end of Arapahoe County? Did you know that Severe Weather Shelter Network is made up of more than 700 volunteers, 35 church partners and 12 service provider partners? Did you know that we have provided shelter for 400 individuals so far this season? You can join us today by going to the 40 HANDS in forty days page and giving a gift in support of our work. Check it out today and help us reach our goal of $10,000! Every November Severe Weather Shelter Network hosts our fall fundraising dinner, called Refuge from the Cold. This fun event includes a number of pieces that are intended to help our event guests learn something more about what we do and who we are and of course to raise necessary funds for the work to which we are called. This year we are hosting See the Need Fund the Need again. This is an opportunity for event guests to purchase material items needed by our shelter guests. Your financial gift might purchase a pair of boots, a sleeping bag or even a tarp. These items are distributed to our guests as the need is elevated to us. On any given shelter night it is not to uncommon for one of our guests to show us their desperate need for a new pair of boots. Sleeping bags and backpacks tend to be items needed over the course of a shelter season…and beyond. Each guest will receive 1 free ticket as they check in. Additional tickets will be available for purchase at $10 each to increase your chances of winning one of our prizes. A great opportunity for you to win a fun family activity…a blessing for Severe Weather Shelter Network to receive the funding necessary to provide emergency shelter. Our Keynote Speaker this year is John Parvensky. John is the CEO for Colorado Coalition for the Homeless and has served in that role for the last 34 years. He will be speaking to us about the power of collaboration to bring about change that benefits everyone in the communities we serve. Severe Weather Shelter Network is honored to have John join us for this annual event. There is no upfront cost to attend this event. You will be given opportunity to give a financial gift in support of the work of Severe Weather Shelter Network during the evening. Severe Weather Shelter Network is hosting 2 walks in partnership with our organizational partners in September. We are very excited about this collaborative event and hope you will join us! These partners have been very important in the building out of the network and the provision of emergency overnight shelter on life threatening winter nights. We have selected these organizations to benefit with us this year. 12 partner organizations have been involved in the planning and implementation of The Journey Home and will be represented in our Camp Expo on the day of the events. Check out this link for more information about the walks and how you can get connected and registered to walk today! 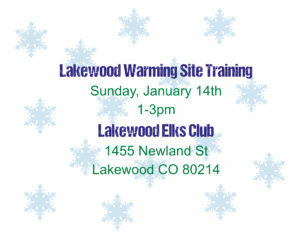 Severe Weather Shelter Network is now recruiting volunteers for the new Lakewood Warming Site! We are excited to partner with the Lakewood Elks Lodge in the use of their building and their volunteer corp to bring this much needed resource to our shelter network. What is a Warming Site? Warming Sites are a very important part of our shelter experience. Shelter guests go to Warming Sites to wait for transportation to the Host Site where they will have dinner and spend the night. The Warming Site provides a warm place for our guests to get in out of the cold for about an hour, confirm their reservation for the night, have access to bathrooms and hot drinks. Volunteers help make the space welcoming and safe for our guests. A good listening ear is always welcomed by our guests as they debrief their day and begin to relax before going to the Host Site. What roles are included in the team? Team Leader: The point person for the night. The Team Leader is the one who delegates other roles to additional team members and is the primary contact for drivers and the Host Site where guests will be spending the night. How can you get connected to help? Contact Lynn Ann Huizingh at lynnann@swshelternetwork.com or 720-515-9313 for more information and to register for the training on the 14th.